impulseplot(sys) plots the impulse response of the LTI model without returning the plot handle. impulseplot(sys,Tfinal) simulates the impulse response from t = 0 to the final time t = Tfinal. Express Tfinal in the system time units, specified in the TimeUnit property of sys. For discrete-time systems with unspecified sample time (Ts = -1), impulseplot interprets Tfinal as the number of sampling intervals to simulate. 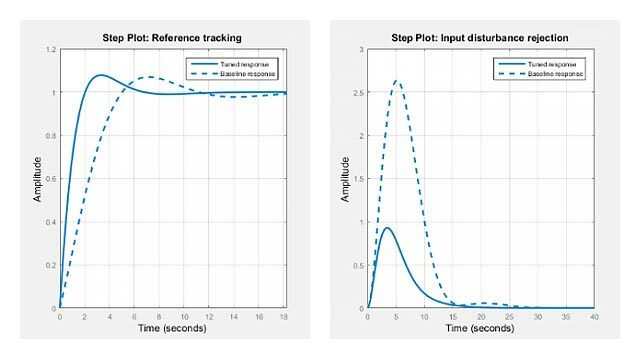 impulseplot(sys,t) uses the user-supplied time vector t for simulation. Express t in the system time units, specified in the TimeUnit property of sys. For discrete-time models, t should be of the form Ti:Ts:Tf, where Ts is the sample time. For continuous-time models, t should be of the form Ti:dt:Tf, where dt becomes the sample time of a discrete approximation to the continuous system (see impulse). The impulseplot command always applies the impulse at t=0, regardless of Ti. impulseplot(AX,...) plots into the axes with handle AX. h = impulseplot(...) plots the impulse response and returns the plot handle h.
Normalize the impulse response of a third-order system. Plot the impulse response and the corresponding 1 std "zero interval" of an identified linear system.